Investigate the events and impacts of World War II with your students using primary resources, museum exhibits and learning activities from the National Museum of American History. To control the form of war messages, the government created the U.S. Office of War Information in June 1942. OWI sought to review and approve the design and distribution of government posters. Posters such as this one and their messages were seen as "war graphics," combining the sophisticated style of contemporary graphic design with the promotion of war aims. Over time, OWI developed six war-information themes for its own internal use, as well as to guide other issuing agencies and major producers of mass-media entertainment. 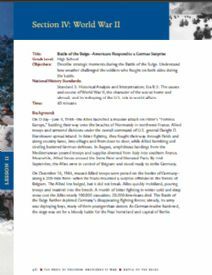 Use a video clip and primary sources to develop an understanding of the challenges facing the ground troops during World War II’s Battle of the Bulge, then take on the role of one of those soldiers and write a letter home. This lesson plan (which includes background information and full-color primary sources) was produced to accompany the exhibition The Price of Freedom: Americans at War, by the Smithsonian’s National Museum of American History. The story of America includes the history of those who have lived through extraordinary circumstances. 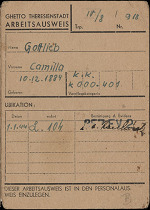 One such person was Camilla Gottlieb, whose ordinary life in Vienna suddenly became endangered when the Germans invaded and annexed Austria in 1938. As a Jew, she confronted devastating changes. With their Jewish heritage reviled and their Austrian citizenship revoked, Camilla and her husband Hermann recognized their peril and attempted to come to the United States. 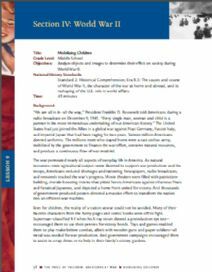 Kick-off a research project on gender roles on the World War II home front with two brief video clips and a selection of primary sources. Once students have analyzed the photographs and wartime advertisements, begin a research project on women during World War II. This lesson plan (which includes background information and full-color primary sources) was produced to accompany the exhibition The Price of Freedom: Americans at War, by the Smithsonian’s National Museum of American History. 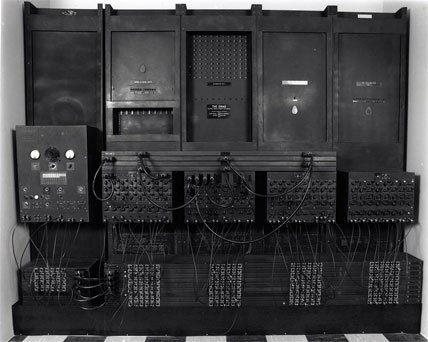 The ENIAC was a large, general-purpose digital computer built to compute ballistics tables for U.S. Army artillery during World War II. Occupying a room 30 feet by 50 feet, ENIAC—the Electrical Numerical Integrator and Computer—weighed 30 tons and used some 18,000 vacuum tubes. It could compute 1,000 times faster than any existing device. Technicians used external plug wires, like those shown here, to program the machine. While leg makeup has been commercially available since the 1920s, it wasn't until rationing was introduced during the World War II that the product became an essential commodity for many American women. 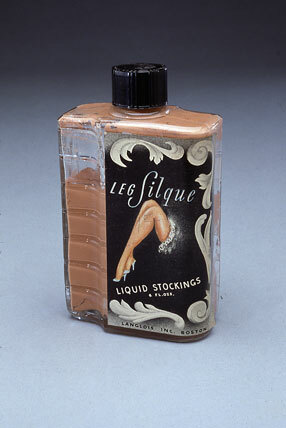 Unable to procure silk or nylon hose, many women resorted to painting their legs with products such as Leg Silque Liquid Stockings, made in Boston, Mass., by the Langlors Company. Some industrious users even drew black lines down the backs of their legs to simulate the seams. In this OurStory module entitled Life in a WWII Japanese American Internment Camp, students will learn about the lives of Japanese American children who were forced to leave their homes and move to internment camps during World War II. The module includes links to hands-on activities, pertinent websites, and a list of recommended readings. OurStory is a series of modules designed to help children and adults enjoy exploring history together through the use of objects from the Museum's vast collections, quality children's literature, and engaging hands-on activities. Ideal for afterschool use, OurStory resources allow students to think critically, to be creative, and to achieve academic standards both in and out of the classroom. Through the use of use of authentic magazine covers, objects from the museum's collections, a timeline and brief video news clips, students will explore the themes of the home front during World War II: the war effort; the ideals that were fought for, the diverse audiences that were targeted, and the varying uses of cover design by different companies. 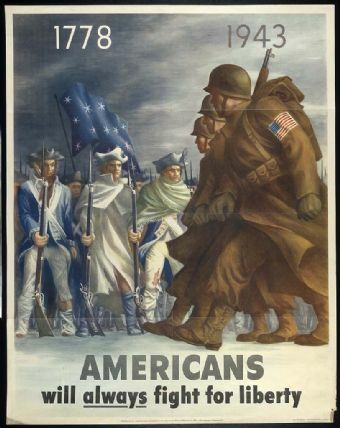 This resource is part of the online exhibition entitled July 1942: United We Stand. 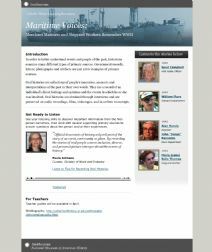 Listen to oral history recordings and examine related primary source materials to learn the stories of the men and women who built and sailed on Liberty Ships to support the allied war effort during World War II. The Web site encourages students to take on the role of historian by presenting them with a variety of related primary source materials and historical questions. 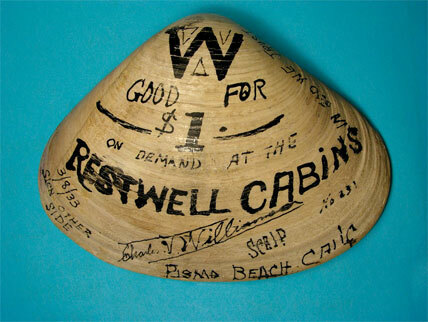 These resources are part of the online exhibition On the Water: Stories from Maritime America. Take a close look at propaganda cartoons and other primary sources to analyze how young Americans were mobilized for the War. This lesson plan (which includes background information and full-color primary sources) was produced to accompany the exhibition The Price of Freedom: Americans at War, by the Smithsonian’s National Museum of American History. 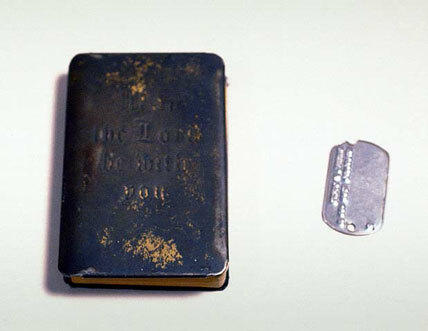 Through the use of a description of the apartment, an excerpt from Mary Scott's diary, and artifact from the period, students will learn about life on the home front during World War II. The Scotts rented apartment on the first floor of an Ipswich, Massachusetts house became a home front battlefield during World War II. The Scotts are one of the families that lived in the Ipswich, Massachusetts house which is the focus of Within These Walls, an online exhibition. This collection teaches students about the changing role of women during World War II: their role in the workplace, increasing presence in the military, and participation in voluntary organizations that supported the war. Students should think about how these activities reinforced traditional notions of gender divisions while they also allowed women to experience new activities. Students will learn how Americans joined the Allies to defeat Axis militarism and nationalist expansion. Sixteen million Americans donned uniforms in this section of the online exhibition The Price of Freedom: Americans at War. The millions more who stayed home comprised a vast civilian army, mobilized by the government to support the war effort. The world-wide conflict that led to the emergence of the United States as an economic and military superpower is divided into sections that allow students to focus either on a specific aspect of the war, or the conflict as a whole. The sections included are titled: Axis Aggression, America Enters the War, Mobilizing for War, "You're in the Army Now", Battle of the Atlantic, The Mediterranean Theater, Storming Fortress Europe, The Pacific Theater; So Others Might Fight; Morale Boosters and Victory and Peace. 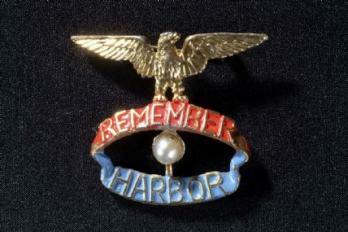 A non-flash version of the site is available: World War II. This image, said to be the most popular poster design of World War II, appeared as a billboard in 1941. Carl Paulson created the design under the direction of the Outdoor Advertising Association of America, Inc., for a U.S. Treasury Department campaign promoting the widespread public ownership of defense bonds and stamps. 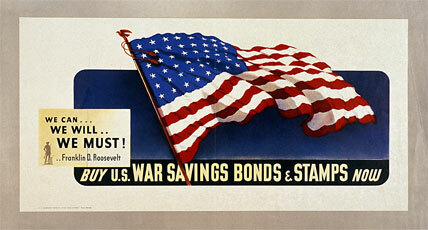 To demonstrate the power of advertising while selling bonds, the billboard industry displayed this image of the American flag at more than 30,000 locations in some 18,000 cities and towns across the country in March and April 1942. The Treasury brought back the billboard for campaigns in July 1942 and 1943. To meet public demand for copies of the billboard, the Government Printing Office printed 4 million small color reproductions.